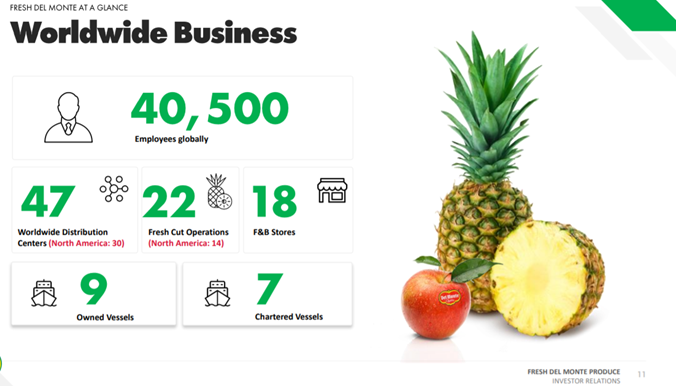 Fresh Del Monte is the type of simple company anyone can understand - they source, trade, and produce bananas, pineapples, avocados, and other fresh fruits. The increasing consumption of these products has allowed them to increase their revenue by 50% over the last decade, which has allowed for greater profitability throughout the cycle. Yet, due to unfavorable conditions out of their control, such as the prices of fruit, earnings turned negative, resulting in the suspension of the dividend. Once prices inevitably recover, the company should be able to make free cash flow between 2 and 300 million, resulting in a 15% total yield at current prices. Asset value, along with stock buybacks, also provides a margin of safety, making this the perfect stock for value investors. Fresh Del Monte Produce (FDP) is the type of company anyone can understand. Founded in 1886, the company originally produced a premium blend of coffee for the Hotel Del Monte in California, transitioning into both canned foods and selling other types of fresh produce throughout the 20th century. After merging with R.J. Reynolds industries in 1979, the company was split into two entities and in 1989, Del Monte Tropical Fruit and Del Monte Foods, with the former turning into the company we know today as Fresh Del Monte Produce. As part of the split, they took the part of the business involved in selling different fruit and vegetables. Fast forward to today and the business has grown significantly from the small operations they once had. They now employ over 40,000 people around the globe and own 47 distribution centers and 9 shipping vessels. 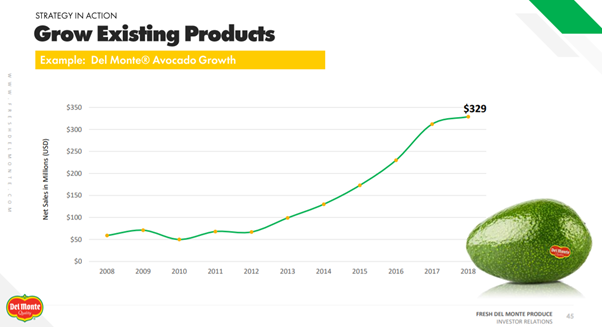 The business is also now far more diversified than it once was, with their main products including bananas (38%), Fresh cut products (21%) Gold Pineapples (11%), Prepared Foods (8%) and Avocados (7%). By making prudent acquisitions, the company has been able to expand its reach globally and slowly increase its market share in its different product categories. For example, they acquired Mann Packing, a leading supplier of fresh vegetables last year, which should allow them to continue to integrate their business into all parts of the food supply chain, from producing the food to shipping it to your local supermarket. They are now one of the biggest fresh food producers in the world and, especially in North America, are a company which millions are indirectly affected by without realizing it on a day-to-day business. They are now the biggest marketer of fresh pineapples and the 3rd biggest marketer of bananas worldwide. Because of this, they now have a very strong brand, with consumers immediately linking them to the sector. All of this would be of little relevance if the company's operations and the industry it is operating in is declining. Fortunately, for investors, there is a lot to like about the company's future. This growth is the reason they have been able to grow revenues by roughly 30% over the past 10 years, which, while nothing spectacular, means that revenue per share has roughly gone up by 50% once share buybacks are included (will discuss in more detail below) - not bad for a company in a mature and competitive industry. All of the above highlights how even if this isn't a wonderful business growing at double-digit rates each year, it is definitely a good solid company that won't be disappearing anytime soon. Yet, with their average ROIC being around 7%, they don't look like the type of company that is ever going to achieve alpha for investors, so the question remains, what's the investment case? As you can see, at least up until 2017, the stock was on a roll, with the company doubling in a span of under 2 years. Yet since then, the stock has crashed back to its previous levels, despite improving revenue numbers. Because of this, it would seem like the stock would now be extremely cheap on a PE basis, but this couldn't be further from the truth. The PE has skyrocketed as the price has dropped, due to earnings crashing over the past year. In fact, although cash flows have actually increased YOY, the company has been forced to cut its dividend entirely for the near future. On the surface, all of this looks very unusual, but it is due to a clause in the company's dividend policy that doesn't allow it to pay a dividend when its Consolidated Leverage Ratio is less than 3.5 to 1. Moreover, the reason for the decrease in EPS that has caused this scenario to even occur is not due to a problem in the company. Instead, numerous factors outside of the company's control have played out at the same time, including bad weather, a worldwide oversupply of bananas, and low fruit prices in Europe. All of these issues are unavoidable and just a part of doing business in a cyclical sector such as food produce, and have come about multiple times before during the current management's 20-year tenure. In fact, a very similar scenario to the one we are experiencing now occurred between 2005 and 2008. From around $30, the price declined to a low of $15, exactly when the PE was at its highest, only to bounce back to $37 once earnings stabilized again. Although history won't repeat itself, it does rhyme, and once the company inevitably recovers, there's no reason the company can't go back to previous highs now the company is bigger than it was 2 years ago. Due to Wall Street being focused on short-term success relative to other firms, stocks such as this are bound to have periods of pessimism, despite the business being arguably far less volatile (sales wise) compared to many "defensive" stocks. Due to the company having a large variation in earnings, it is important to take the average of a cycle to estimate the companies potential earning power. Over the last 5 years, this ends up being $2.55 a share. This means the company is trading at 10 times their average earnings in a no-growth scenario currently, which means that investors are already receiving an earnings yield of 10%. Furthermore, at the top of the previous cycle, the company managed to achieve earnings of $4.74. 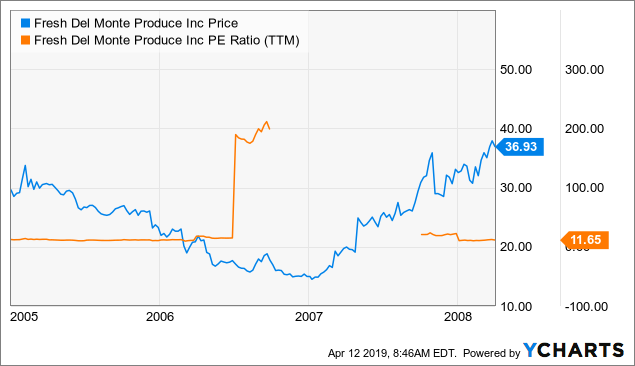 Should they be able to earn $5 in a similar year within the next 10 years, given a PE ratio of 15, the stock will be at $75 dollars - giving a compounded return of 11%. If they can reach this number in even less time, the potential growth is even greater, with returns in excess of 15% should the company be able to achieve this in under 5 years. 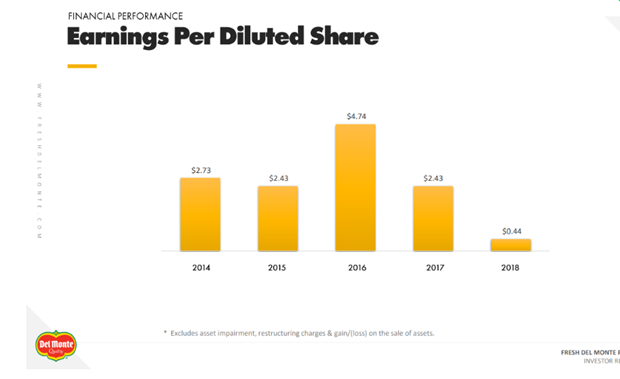 Moreover, management has typically been very shareholder-friendly, with them reducing total shares outstanding from 64 to 49 million over the past 10 years. 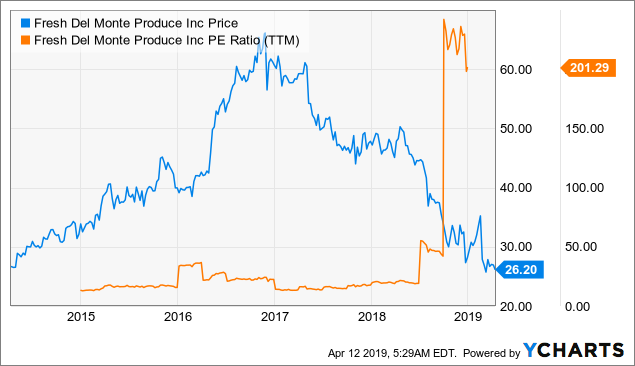 This allows for EPS to be even higher during the cycle and could see the company's long-term average increasing from $2.55 significantly over the next decade. For those that are still not convinced that this value play is as safe as stocks come, simply look at the large margin of safety their balance sheet. For starters, they trade at just 0.8 times their book value and only slightly higher than tangible book, along with having a price to sales ratio of just 0.3. Of the $3.2 billion worth of assets on the company's balance sheet, property plant and equipment total $1.2 billion after depreciation (and $2.3 billion beforehand). Looking into this property more closely, we see that it is made up of over 62,000 acres of land, 11 ships (and soon to be 18), and the 9 distribution centers that the company directly owns. Regardless of the company, these are all assets that are clearly valuable to a potential owner of the business, and the fact that the company now trades below PB makes me believe the bottom has almost arrived for the company's stock price. Previous cycles also validate this point, and with the exception of 2009 (the trough in a global recession), the company hasn't fallen below this range. 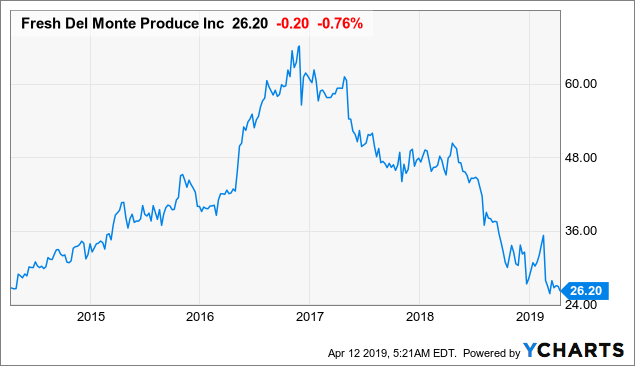 Contrary to what some have recently been saying on Seeking Alpha, Fresh Del Monte's management is very experienced, and despite it looking bad now, it has previously shown an ability to bounce back from cycle lows - something I am confident they should be able to do again. The CEO Mohammad Abu-Ghazaleh has been in charge since 1996 - 23 years, and owns a staggering 37% of the company. Despite this, with a current age of 77, it is not unlikely that he may wish to step down in the future, which could result in him wanting the company to be acquired as has happened to many of its competitors recently. 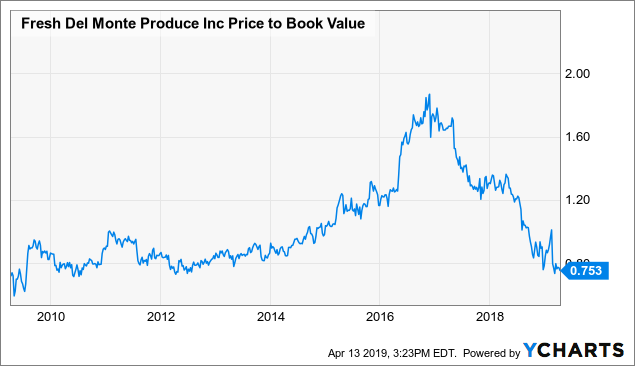 Should this be the case, based on the 9 times EBITA, Dole Food was recently sold for, they should be valued at 10 times (due to it not having near as many problems) - double the current price. 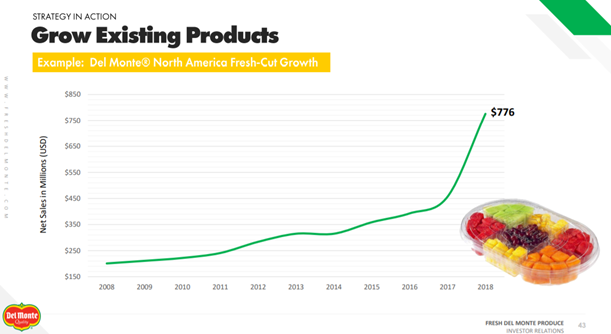 Fresh Del Monte is nothing special - but it is a good business, and it will continue to grow (albeit slowly) in the future as it has done for the past 100 years. Although the limited growth available for them would usually put me off owning it, the fact it is now trading at firesale rates means that the potential upside for shareholders is now far greater than long-term growth rates. This should ultimately result in large gains, should they be valued like a "normal" producer, which will occur once the dividend is reinstated, and they start to return a profit again. In my opinion, judging by the roughly 200 million in FCF that the company makes in average conditions, the company should eventually be valued at a market cap of 2 billion - 48% upside from current prices. If they have a great year, the potential growth could also be far higher, since irrational valuations occur at both extremes. This is why I am initiating a position at current prices and believe this company is a STRONG BUY under $30. Disclosure: I/we have no positions in any stocks mentioned, but may initiate a long position in FDP over the next 72 hours. I wrote this article myself, and it expresses my own opinions. I am not receiving compensation for it (other than from Seeking Alpha). I have no business relationship with any company whose stock is mentioned in this article.